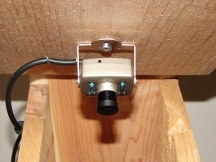 A color video cam, with infrared night vision, built in microphone, and a weather shield. Comes fully wired with 100' RCA (audio-, video-in) cable. Although the image is color, be aware that colors inside a birdhouse will be muted. Infrared lights automatically take over when natural light levels are too low resulting in a black/white picture.